What this is not is a shameless plug for my own beer. You can be assured of that since I don’t actually brew beer myself, instead letting others do all the hard work and then (shamelessly, I promise you) reaping all the benefits. One person I’ve been lucky enough to do this with is my friend Trevor Doyle. From a plastic cup filled with Pale Ale while “tailgating” in a parking lot to a Berliner Weisse on the back deck of one of our homes, I’ve learned to never pass up a chance to try one of Trevor’s beers, as good as they are. So this is most definitely a plug for Trevors’ beers instead. And it comes well deserved and absolutely shamelessly. 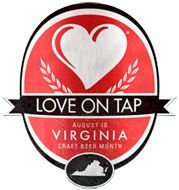 It also comes as a recommendation of sorts which most anyone in Roanoke can act upon, because soon, Trevor – with a little help from his friend Bryan at Big Lick Brewing – is bringing one of his recipes to the taps at Big Lick, possibly as soon as this weekend. “Strangest Tribe” is a Pale Ale made with Simcoe, Centennial, and Amarillo hops which is then dry hopped with that same line up and comes in at around 5% abv. The beer also benefits from an addition of oats, offsetting what would be a thinner body from such a lower abv beer. Borrowing a name from a Pearl Jam song, as many of Trevor’s beers do, Strangest Tribe should come across with plenty juicy hop character from the Amarillo and Simcoe, both of which are known for their citrusy qualities. Amarillo often pushes up an orangey, somewhat grapefruity aroma, and while some like to pigeonhole Simcoe for largely pine like notes, for me, beers using the hop also blast forth a grapefruit like, citrusy aroma as well. But when it comes to trying Trevors’ beers, especially in his company, it’s not all about the beer. If you happen to know Trevor, you are well aware that he not only has the ability to make good beer, but he comes with more than a few stories to tell and even more (often sharply pointed) opinions on a wide range of topics, which include, of course, the different circumstances by which to enjoy good beer. I remember he once mentioned how he appreciates a person who can simply enjoy having a beer without spending fifteen minutes dissecting it down to its individual molecules. I believe the description was, “He’s just a guy you can grab a beer with”. I appreciate the same thing. I’m looking forward to trying Strangest Tribe, and hopefully I’ll run into Trevor down at Big Lick while doing so. After all, Trevor has always been “one of those guys” you can definitely just grab a beer with. Perhaps being that way somehow affects the care he takes in making his beer, and is why, like many of the others I’ve tasted, Strangest Tribe will be great as well. Deschutes’ Black Butte Porter: Body, body, body. Don’t get me wrong, it isn’t a ‘heavy’ beer by any means of course. And yes, perhaps most porters are a little thinner than most might expect from their appearance, let’s say compared to your average stout. But that’s not to say that they always have to be watery thin, as so many breweries’ flagship Porters are, and that’s where Black Butte, for me, wins major points. With aroma and tasting notes of fresh brewed coffee, roasted grains, and a slight hop bitterness that whips around at the end, Black Butte’s body is what elevates it from an solid, well made beer to an exceptional one. Silky smooth with just enough weight to appease as a sipping sort of beer, Deschutes’ porter stands out, similarly to Founders’ Porter, over most others you’re likely to find out there. Apparently, the Governor himself particularly loves this beer, after having tasted it during the courtship Virginia had with Deschutes, I have to admit I wholeheartedly agree. I hadn’t planned it this way, but for what its worth, it did work out well, didn’t it? My last post to the blog was some time ago. But I figured given the topic, if it had to stand on its own without any updating or polishing up, it would do perfectly fine. Considering that it covered one of my first experiences with a Deschutes Brewing beer, and given all the growing curiosity Roanoke has had over whether the West coast brewery – and the 7th largest in production among “craft” breweries in the US (2014) – would pick the Star City as the site for its East coast location, the post seemed better than any to adorn the blog while I took care of a few non-blog related things. Today, we can finally add the accompanying, and appropriate, bookend to that post. Deschutes is coming to town. In the coming weeks, I’d like to share a few other experiences that I’ve had over the years with their beers, as an attempt at perhaps a “primer” of sorts for some of the breweries’ ales. For today, I think this simple post will do just fine. By the way…a more immediate primer will be available, apparently, at this weekend’s “Big Lick – For The Love of the Brew” beer festival, where at least a couple of beers from Deschutes’ beers will actually be available – quite a kick off, right? Honestly, I don’t remember how I acquired the beer. But with ease, I remember its aroma, how it tasted, its body, and the setting in which my wife and I shared Deschutes’ XXV Anniversary Black Butte Imperial Porter on one chilly night in September, 2013. If you’re deeply entrenched in good beer like I am, you know it often goes just like this. The truly outstanding ones, you remember all of it – when you had it, where you were, who you were with, and, as you might have noticed, possibly even how the weather was outside at the time – you recall nearly every detail. The taste, the aroma – it all creates a distinct, fond memory, but with this particular beer came one additional detail which, when I look back on things, might have been the most important: how that particular beer would affect my beer choices going forward. Important to understand is that while I don’t remember exactly how I came across it, I do remember that it was one of the first beers I went out of my way to get. With no distribution to Roanoke, and with the Black Butte anniversary beer being a somewhat limited release, I couldn’t just pick up a bottle at my local craft beer store. And although I would never pigeonhole myself into favoring one style over another, I admit that if I were faced, heaven forbid, with a one final beer-before-you-die question and it came down to some world class porter/stout or a more typical hop forward beer – yes, I’d probably pick the latter. But after having it, the Black Butte XXV was, of course, enough to make me rethink that kind of decision. So needless to say, it was definitely worth acquiring – so much so, that other beers of its kind would be too. And in that fact lies what might have been most important about tasting the Deschutes Anniversary beer that evening more than two years ago. If I had a curiosity for other, well made beers that were perhaps outside of my local availability, this beer poured gasoline on the fire. It goes without saying that this isn’t to knock any product at all that has been or is currently available on the shelf at my local craft beer stores. It is to say that this particular Deschutes beer was a stepping stone of sorts to seek out beers being created in other cities, or even in other states. And while we may not have put the kind of mileage on the car that some I know have, traveling to the west coast or even to such northeastern havens for craft beer such as Vermont, but we have tallied up plenty of miles attending beer festivals, release events, and breweries not necessarily within easy driving distance, and of course, it’s all been more than worth it. And so this is how it goes with good beer. One outstanding example inspires you to seek out another, or maybe even the selection from an entire brewery. An out of this world imperial stout or porter whets your appetite for trying more of the same style, and in turn those may take you off in some different direction as well. Put simply, good beer begets good beer for the curious beer drinker. I also can’t help but think about how that beer which I tasted some two years ago and caused such inspiration for myself is crafted by the same brewery my city is currently courting for its east coast expansion project. Begun just over a month ago, the Deschutes 2 Roanoke Facebook page has over five thousand followers and continues to grab the attention of the Oregon based brewery, with media outlets both here in Roanoke and in Bend, home of the brewery, reporting on the growing interest. Should Roanoke land the project, I also can’t help but think of how other craft beer curious folks in the region might seek out Deschutes and in turn, have it inspire them to reach out to other breweries and beers, both here in Roanoke and elsewhere. For myself, I can’t help to think of how that one particular path to good beer would’ve truly come full circle. Last weekend saw Roanoke’s annual Microfestivus beer festival mark its 18th anniversary with the expected wide variety of beers and beer styles, which as always, presented a good way for those still getting fully into craft beer to expand their tastes. Tomorrow, August the 15th, Roanoke’s Barrel Chest Wine and Beer is celebrating its one year anniversary by hosting a festival of their own, their first “Barrel Fest”, focusing almost exclusively on barrel aged beers. For those who cannot get enough of the immense variation of aromas and flavors which placing a beer in a previously used bourbon, wine, or other similar barrel can add to the beer, this is a first ever event for Roanoke, and something that you should most definitely make your way to. The list of beers scheduled to be available only underlines the need to attend, including gems from breweries such as Hardywood Park, Adroit Theory, The Bruery, Goose Island, and Avery, just to name a few. The folks over at Barrel Chest also seem to have planned the event with a level of experience that can only come from attending functions like this before, selling tickets with not only with tiered times of admittance, but with a total cap at 250, so as to make sure “crowds are manageable”. Noon tickets are already gone, and the next “level”, 1pm tickets, will only be available until the 250 capacity is reached. The details can be found on their Facebook page here, or more specifically on the event portion of that page here. I’m sure the store will also keep everyone updated on the availability of tickets on those pages as well.